Male Theridiosoma gemmosum, from Pavouci. The Theridiosomatidae are minute spiders found in shaded and humid areas. They construct orb-webs that they pull into a dome shape by a taut thread extending from its centre (Jocqué & Dippenaar-Schoemann 2007). 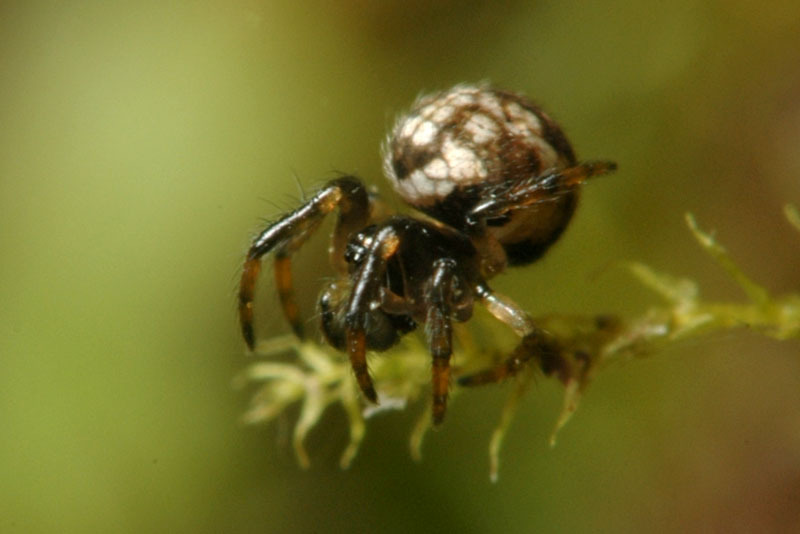 Characters (from Jocqué & Dippenaar-Schoeman 2007): Very small; eight eyes present; legs with three tarsal claws; long trichobothria on dorsal side of tibiae III and IV, usually 2–4 times as long as diameter of tibia; pit organs present on prolateral margin of sternum; ecribellate; entelegyne; spermathecae connate. [W76] Wunderlich, J. 1976. Spinnen aus Australien. 1. Uloboridae, Theridiosomatidae und Symphytognathidae (Arachnida: Araneida). Senckenbergiana Biologica 57 (1–3): 113–124.